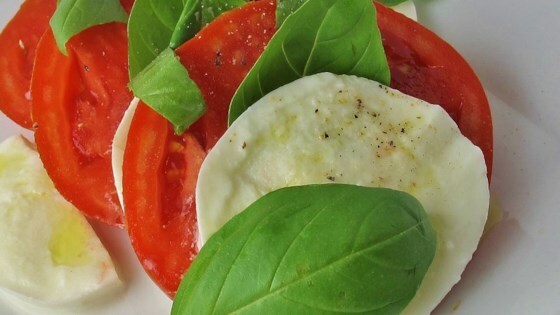 "Because this salad is so simple, fresh, top-quality tomatoes and mozzarella are important." We made this, and it was okay. It was very easy to make but didn't knock my socks off. Make sure when you make this, you have really excellent ingredients, otherwise it will come out mediocre. I love this salad. I use only the freshest mozzerella and drizzle 2/1 ratio of olive oil and balsamic vinegar. My husband and I could eat this everyday during the summer. Try chiffonading the basil (slivering) and splash with some balsamic vinegar.